There's something special about being in a place where events occurred which changed the course of history. The fact that there were human beings alive and doing stuff all those years ago right there where we stand at any given time creates some sort of tangible mental, and perhaps physical imprint. Whether visiting a shoe a Roman left in a bog in 24 AD, or the house where Ann Frank hid awaiting her fate, the feeling is the same; a connection with what's gone before. A sense that something really happened. Hair stands erect on the back of the neck. We stood with fans from several generations queuing patiently for admission to a museum where half of the exhibit was still alive, still very much a piece of modern life. Familiar tunes tempted pheromones. The neck hair quivered in anticipation. For the older generation this was nothing that hadn't been experienced at the time it occurred, if not first hand, then from the pages of Rolling Stone, Go-Set or even the Women's Weekly, or perhaps from television (in black and white) in the better neighbourhoods. It is almost unbelievable to to me that I used to listen to them on a Crystal Set at a time when "transistor radios" were available for the upwardly mobile at a price that today would buy a small house. Not that there was such a thing as upwardly mobile in the 60's, but there were plenty of small houses. There were more small houses than transistor radios as a matter of fact. For us, this wasn't visiting history, it was a trip down nostalgia lane. I once owned a beatle wig just like the one in the display. I once wore a thin black tie and had a jacket with no collar. I'd owned a pair of circular sunglasses. I wondered if time would allow the place to evolve into a genuine museum of pop culture, or will it fade like a cheap sideshow with the fading of the other half of the exhibit. At ten quid a pop and another six for parking, perhaps it'll fade like an expensive sideshow. For the newer generation it seemed to be a pilgrimage of sorts, a metaphoric journey to where things which had a great influence on their time had taken place. Although these occurred long before their birth there was a curious itch that needed a salve. They saw things they hadn't experienced. They experienced things they hadn't seen. Even so there was something missing, I think we all felt it but could not express it. We were in Liverpool, the heart of Merseybeat, but we weren't where anything actually happened. It hadn't happened where we stood. This was no Cabinet War Room sealed in a perfectly preserved time capsule for three generations. This was a plaster of Paris and chicken wire recreation, and it could have been recreated anywhere. It was interesting, but the hair on the backs of our necks remained prostrate. 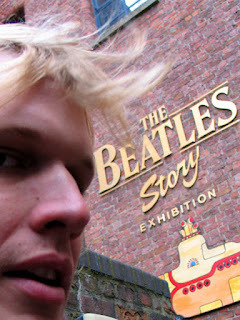 Yes, I couldn't have summed the Beatles Experience up any better. Everything that was there was gone. It was nice, but we could have been anywhere. Now to get down to some corrections. As John Lennon exclaimed when a careless studio technician announced, 'Take 1 of 'For the Benefit of Mr Kite'..." -'It's "Being for the Benefit of Mr Kite'!" I never liked that song anyway. Just after posting my smarty-pants comment, I noticed a glaring punctuation error, which was bound to come back and bite me. Damn, and I thought I had three comments, when actually I had one, and erased one, and an explanation for the erasure! I've been bitten like that before too! I'm glad you felt like that too, not glad that you felt like that, but that I wasn't wrong in feeling how you felt!